So why would you want to mess with a smart battery controller anyway? Consider the case of one ThinkPad X100e I purchased a few months ago. Battery dead. Querying the controller reveals it's had 43 charge/discharge cycles so the cells are practically new! And yet the controller was in permanent lockout mode due to a single overdischarge condition getting logged. Trying to charge the battery in the laptop resulted in a rapidly flashing charge LED indicating charge failure. Some people will say "Well that's by design, a single overdischarge turns Li-Ion cells into potential fire-bombs!" If that was true there would've been a lot more cases of batteries setting houses on fire back in the early 2000s as "0V deep discharge recovery" used to be a feature in some laptop battery pack controllers back then. It's not nearly as bad as some urban legends would have you believe. Clarification: True 0V discharge kills Li-ion cells and you shouldn't attempt to recover them. The old controllers tried to fix over-discharged cells and they succeeded in the majority of cases because you rarely have a true 0V scenario unless you have a shorted cell or something. The new controllers on the other hand happily commit suicide at over-discharge voltages where cells are still easily and safely recoverable with little to no capacity loss. For the manufacturer, taking no chances from a legal standpoint is understandable but sometimes they can go a little overboard. A 3.5hr battery ending up in a landfill is not the best outcome. Another reason would be for re-celling the pack. You have some options when the battery of your laptop dies: Replace the whole shebang because it's too slow anyway, replace the battery with a factory one for $100+, buy a chinese knockoff for $20-50 or re-cell with good brand cells for $20-50ish. Ok, so how do you talk to these controllers? SMBus, which is I2C's impatient cousin with nasty hard timeouts and bulk transfer modes not standard in I2C along with a RESTART condition in addition to the START and STOP you normally deal with (... or just 1-Wire in more exotic hardware but let's not think about that). How nasty are the timing constraints? You can implement I2C through a USB serial dongle's flow control pins. You can't implement SMBus because your code, the windows API, driver, USB stack and controller firmware response overhead added up is over the limit (especially if your serial thing uses only USB1.1). You can't keep the clock idle for over 35 milliseconds or the controller drops the conversation. But don't go TOO fast because SMBus can't go over 100Khz (I2C can do 400). All that rushing and it can't keep up the pace in the long run, figures..
Did I mention that different controllers seem to have slightly different timing requirements? The most well supported interface for speaking with smart battery packs is the Texas Instruments EV-2300. It's a fairly expensive piece of kit but it has the advantage of being able to work with TI's own software which has a myriad of options for the publicly available TI battery controllers running the TI firmware but more on that later. Once reliable SMBus communication is established you will have access to a battery controller that talks the SBS Standard! It's a standard so we're basically done now. We just look at the standard documentation on how to clear any failure condition and reprogram the controller to our desired parameters, easy! Ha! Yeah, no. The SBS standard only defines the very basic functionality for a smart battery controller. The controller will have something sometimes referred to as a "sealed" mode which is where it's only going to service the limited SBS standard requests. This will be the standard mode for the battery as that's all that laptops need. No touchy on any of the settings that really matter and certainly no clearing of any error conditions. They'll sometimes have a command to "unseal" and enter full access mode where some or all settings are modifiable with a mixture of standard and unstandard commands. Most of the time this unseal command will be password protected or worse. Some TI controllers are like this while other controllers will only implement a sealed mode for SBS compliance and a completely proprietary bootloader mode to modify flash memory content directly (which may or may not also be entered in a similar way). It's really a mixed bag. What's similar in all SBS microcontrollers is that getting into the Boot ROM where you can access and modify flash memory is hindered by the firmware that's already running on the device. Texas Instruments is a BIG player in the smart battery world. They sell their battery management microcontrollers and analog frontends to pretty much everyone making battery packs. Some companies buy the whole package that is, the microcontrollers with TI-developed firmware. The security model mentioned above (sealed/unsealed/bootrom) is actually used mostly by the TI firmware. These pre-programmed micros under the "bq"-line usually have a letter in their model number such az the bq20z90. What's somewhat less known is that the bq20z90 is also sold WITHOUT the TI firmware as the bq8030(DBT). At the very least SONY and Sanyo have opted to buy the bq8030 with the accompanying (super-secret) SDK and develop their own firmware for their battery packs with it. Did they not trust TI's expertise? Was the firmware too expensive to license? Did the TI firmware not do everything they wanted? Who knows! But the fact is production bq8030s are pretty much complete black boxes as they run a proprietary firmware and don't work at all with TI's own software. Other bq series are sold similarly as both pre-programmed and unprogrammed versions. The bq8050 would be another example though I don't know what the pre-programmed counterpart's model number is. The EV-2300 will still talk to the chips running 3rd party firmware but the TI software will not work for anything other than simple SBS reporting. So the obstacles to hacking smart batteries are numerous but let's take it one step at a time. First up.. the interface. Introducing SMBusb, a USB SMBus interface based on the Cypress FX2LP CY7C68013A(datasheet) USB Microcontroller or more specifically the dev-board that's available all across eBay for around $5 shipped. But all FX2LP based boards should work as long their firmware isn't pre-programmed into the EEPROM. (*): This controller is just a bare board with no cells connected. And chances are you already have an FX2LP device laying around in your drawer in the form of an Altera ByteBlaster clone or one of the many USB logic analyzers that use it. You only need to access the hardware I2C pins for SMBusb to work and an easy point to get at those is the onboard EEPROM which is usually a nice big SO-8. So where is this project? Any reason for choosing this specific board? Would an msp430 be enough for this task? You made me curious for that board too! I'll put an order for it, but currently I have a handful of MSP430 in my drawer, so I'll look into porting your code (most of it should be reusable, just a matter of changing pins and registers). I'll let you know about it when I find the time to do it. Thanks for your quick reply, and congrats on your awesome work! Any chance porting the code into MSP430? I want to do the same thing, just with a PIC18F2550 or PICkit2 laying around. They're all USB2.0 standard so maybe they're up for the job? Hi Victor, amazing job you have done. Thank you for sharing! I bought recently this board for testing with some spare notebook battery packs, but I can't communicate with the board at all. The board is recognized (lsusb output: "Bus 002 Device 010: ID 04b4:8613 Cypress Semiconductor Corp. CY7C68013 EZ-USB FX2 USB 2.0 Development Kit"), but then it disappears. Running "smbusb_scan -a" shows me "Error Opening SMBusb: libusb error: -1". Also, "dmesg" shows me "usb 2-1.1: device descriptor read/64, error -110". I tested with several computers and different ports with no lack (even crosscompiled the source for a Raspberry Pi). Some forum guys stated that could be related to bad USB cable or power, but the board is supposed to require less than 100mA. Of course, tested also with several cables. Also verified with sigrok-cli: the card is recognized, but when trying to output some samples, it fails ("fx2lafw: Device failed to renumerate", while run with "sigrok-cli -d fx2lafw --loglevel 5 --samples 8"). Do you have some clue on how to solve this issue? I am a software guy with some knowledge about electronics. The board was bought brand new from eBay, I don't feel is damaged and handled it with special care. Someone contacted me through email a while ago and had pretty much the same issue. Quote: "the FX2LP board that I got first was duff. couldn't get it to work with any software. so I bought another one, and that works". So it could be that the chip or the board is defective in some way. Now if that works I'll have no idea why... if it doesn't then bad chip/board would be my best guess. Hi Viktor, thanks for the quick reply. I tried the commit you mentioned (after manually checking out fx2lib submodule) with no lack. My assumption is that the board is fake: According to some tests, it can be able to upload some small firmwares (less than 4KB), but when I manually upload yours (or Cypress' Vend_Ax.hex), it fails in the middle. That's why I think this is just a "FX2" CY7C68013 version (with no ending letter A). This version has 8KB instead of 16KB that FX2LP has. Also the output of lsusb I've commented previously acts as a confirmation. I will try to get a new board. In the meantime, will try to fix the one I got. Maybe I can play with a Raspberry Pi, it apparently has support to I2C and SMBus, what do you think? You may be right though the lsusb output for my board is only "FX2" as well. Wouldn't be surprised if they were just using chips that failed factory testing making the board purchase a crapshoot even. I looked into it a bit and linux's libi2c-dev has SMBus transaction functions so that's 90% of libsmbusb right there. It looks like it would be fairly straightforward to port most of the tools to use it with the exception of scan and r2j240flasher because that chip doesn't use standard SMBus once in the boot rom but still uses the RESTART condition and I'm guessing that linux doesn't give enough control over the i2c peripheral to implement that. Let me know how it goes if you decide to tackle it! I got a new battery for my ThinkPad X250 that's broken. Unfortunately they used a TI bq9000 and that has no datasheet. I tried scanning the bus with an Arduino but without success so I ordered the USB interface. Unfortunately I've heard that they've added improvements to the BootROM entry protection in the bq9000/Sanyo firmware so you probably won't be able to get in using the method in the 8030 article. The flasher tool might still be compatible but someone has to reverse engineer the new protection first. You are right, but that link was posted just to show that bq9000/Sanyo was reversed, so if somebody could do it, its possible to do that. Advertisement was not the aim of that post. As well as others me too want to restore my battery which has bq20z90 gas gauge controller. And me no wish to pay any penny for that third party commercial products which (by opionion of some users) are cracked, modified and recompiled versions of TI evaluation software, which is free. Will not pay even one day licence as it costs as half of new battery. And to use this one day license you should carry out major scope of job like dissasembly the batteries, buy and pack new elements, spot weld them before, read much docs and so on. And no warranty that you will succesfully carry out data flash correction. The question is how that third party tools can bypass manufacture protection and go into unseal and full access mode for 5 sec without knowing actual password (they declare to work with almost any bq chip). it seems like backdoor was left by TI and that guys found it or there is a leak from TI or even that soft is produced by TI subbranches. I've been in contact with someone who looked at the bq9000/Sanyo and had access to software that could enter the boot-rom on it. The firmware is definitely based on the bq8030. The first and last steps to enter the boot-rom are the same. It's the challenge(read from 0x73) & answer(send to 0x71) part that they've worked on. The bq8030 gives you a single fixed challenge and you just need to give it the proper answer to reach 0x10000. On the bq9000 it gives you a random challenge value and you're supposed to answer based on some sort of secret key/algorithm which if correct will increase the next challenge value by some amount and you need to do this repeatedly until you reach 0x10000. So that's nastier but could probably be solved based on firmware disassembly without TOO much difficulty. I don't think there's a universal way in, especially on the custom firmware chips. The guys developing the payware stuff likely run/ran battery re-celling businesses of their own and had access to TONs of batteries to experiment with. Also, if the entire bq line retains the CoolRISC core along with the electrical vulnerability I used to retrieve the firmware dump from mine with then it's just a matter of perseverance and struggle to understand obscure assembly code to crack protections on them. probably you have bq9000 with newer firmware, there is at least bq9003, bq9000_T1, bq9000_L1 subversions. Algo to gain full access may be different between versions. I have firmware of older version of bq9000 with Sanyo firmware, so if somebody like to analyse for which algo it used I can send in PM the binaries. Feel free to let me know once you've established contact and I could censor the comment with the email address if you'd like. Firmware sent, so you can delete the message. Me have USB-to-I2C board based on CH341A level converter (chinese development probably copied from FTDI ICs). It cheap enough (3USD at ali uncle) and very handy as it also support SPI, USART and EPP, and can be used for programming various kind eeproms and avrs. It also used libraries libusb or libusbk (or Zadig driver) as well as FX2LP board. 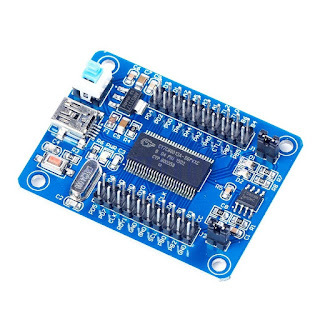 In this view is it possible to use some portion of SMBusb code to link it to libusb driver so that CH341A usb board could be used to work with SMBus. Chinese maker also gives SDK for that board so if it make sense could you please point me to the place in source code where itwouldbe possible to link it with ch341a driver to make functioning with SMBus. Thanks a lot for any suggestions on this.. The tools use a library called libsmbusb (/lib in the source tree) that exposes protocol-level functionality eg. SMBReadByte, SMBWriteBlock. The library talks to the firmware. You would need to reimplement that library using your own hardware. Note though, that if that chip doesn't have a hardware i2c peripheral and you have to bit-bang it from code running on the PC then it's probably not going to work (SMBus timing restrictions). having received one FX2LP now doing first steps in learning the SMBUsb tools. While polling the battery controller with SBS command all working nice but command 0x23 (Manufacturer Data) which returns some odd bytes. there is in fact 17 bytes long output returned although reported as 14.
whereas it expected to be unsigned one, in the libsmbusb.h header. So odd 3 bytes 'ffffff' missing now in the output and its length is correct. Help me please. I built a USB SMBus interface based on the Cypress FX2LP CY7C68013A. Everything works, smbusb_sbsreport gives the answer. I can't figure out how to send the command "unseal" consisting of two words. Controller chip is Bq20z90. I need to send the command 0x60 with two password words as written in the datasheet. The 0x60 command is a part of the 0x00 Manufacturer access command. Default unseal password is installed on my controller. What is the sequence of commands to send two words unseal code? Write an example, if not difficult. Hi Yuriy! Read carefully sluu264a datasheet, 0x60 is NOT a part of Manufacture Access command. It's separate EXTENDED SBS command available with Full Access to gauge ONLY. It intended for reading or modifying 'Unseal Key', and not for Unsealing procedure. last command should return two bytes of 'OpsStatus' register which contain 'FAS' and 'SS' bits, if it starts with '0' or '8', your gauge is unsealed with full access. Thanks for your reply! It turns out that the two words are sent one after the other and without interval. I'm gonna try that. Hi. Very grateful for the help! I'm travelling now. I'll do it when I get back. SMBUSB here I come. Arduino land for me.. Just Lazy. Saleae debugging is a breeze with i2c style stuff, even setting up your own protocol if you really must. Have cypress stuff before 10 years ago. It is nice. I have at least 3 battery packs to make happy, all with good cells. As for the magic smoke? We shall see. Don't create it very often, anymore. Memories: My first switchmode design was pre-1980 - 3KW plasma cutter. I download all files for SMBusb and install driver for FX2lp but when open build.bat nothing happen? Can you says how to install software? I can not find anywhere step by step installation? I would be very grateful to you! Did you check the prerequisites for windows on the github page? You'll also have to apply the patch file manually by downloading a port of gnu patch for windows (although it might work without it). There is also an older windows binary package on the Releases tab though YMMV with it. That's all the help I can offer. Yes I check prerequisites for windows...I am install Tdm-gcc and download libusb-1.0...when I open flasherbq8030 abort dynamic link libusb.dll is not located...where I need to write the command smsbus_scan? Hi! I try scan by smbusb_scan with FX2LP, on each line I see "ERROR: -9". How I can find interpretation of errors?